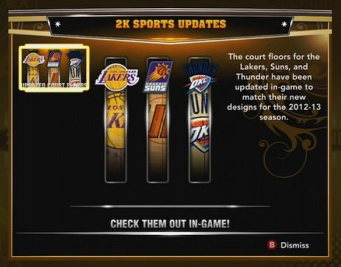 The court floors for the Lakers, Suns, and Thunder have been updated in-game to match their new designs for the 2012-2013 season of NBA. 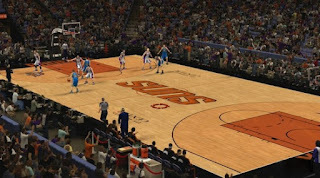 Description: NBA 2K13 released a patch that will update the following courts: Staples Center (Lakers), US Airways Center (Suns) and Chesapeake Energy Arena (OKC Thunder). 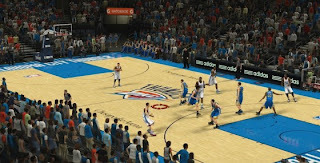 This patch will download and install automatically as long as your XBOX 360 or PS3 is connected to the Internet. For PC users, download the "Online Data" below and paste it in your NBA 2K13 (Roaming / AppData) folder. • Type %AppData% in the search. 2K Sports will release another court patch soon for the Charlotte Bobcats and San Antonio Spurs.